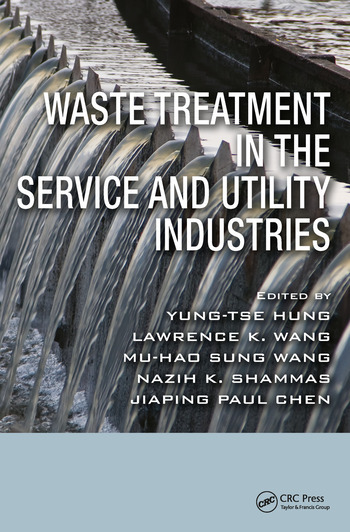 This volume provides in-depth coverage of environmental pollution sources, waste characteristics, control technologies, management strategies, facility innovations, process alternatives, costs, case histories, effluent standards, and future trends in the process industries. 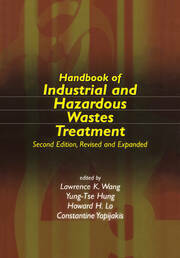 It delineates methodologies, technologies, and the regional and global effects of important pollution control practices. 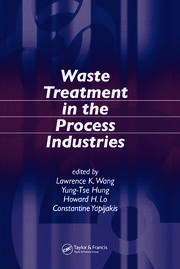 The authors focus on new developments in innovative and alternative technologies, design criteria, effluent standards, managerial decision methodology, and regional and global environmental conservation specific to process industries. An Deng, Yung-Tse Hung), and Lawrence K. Wang. Yung-Tse Hung has been a professor of civil engineering at Cleveland State University since 1981. He is a Fellow of the American Society of Civil Engineers, and has taught at 16 universities in 8 countries. His research interests and publications have been involved with biological processes, and industrial waste treatment. Dr. Hung is credited with over 470 publications and presentations on water and wastewater treatment. He received his BSCE and MSCE from National Cheng-Kung University, Taiwan, and his PhD from the University of Texas at Austin, USA. He is the editor of International Journal of Environment and Waste Management, International Journal of Environmental Engineering, and International Journal of Environmental Engineering Science. Lawrence K. Wang has over 28 years of experience in facility design, environmental sustainability, natural resources, resources recovery, global pollution control, construction, plant opera¬tion, and management. He has expertise in water supply, air pollution control, solid waste disposal, water resources, waste treatment, and hazardous waste management. He is a retired dean/director/VP of the Lenox Institute of Water Technology, Krofta Engineering Corporation, and Zorex Corporation, respectively, in the USA. Dr. Wang is the author of over 700 papers and 45 books, and is credited with 24 U.S. patents and 5 foreign patents. He received his BSCE from National Cheng-Kung University, Taiwan, ROC, his two MS degrees from the Missouri University of Science and Technology and the University of Rhode Island, USA, and his PhD degree from Rutgers University, USA. Currently he is the Chief Series Editor of the Advances in Industrial and Hazardous Wastes Treatment series (CRC Press of Taylor & Francis Group) and the Handbook of Environmental Engineering series (Springer). Mu-Hao Sung Wang has been an engineer, an editor and a professor serving private firms, governments, and universities in the USA and Taiwan for over 25 years. She is a licensed Professional Engineer, and a Diplomate of American Academy of Environmental Engineers. Her publications have been in the areas of water quality, modeling, environmental sustainability, waste management, NPDES, flotation, and analytical methods. Dr. Wang is the author of over 50 publications and an inventor of 14 US and foreign patents. She received her BSCE from National Cheng Kung University, Taiwan, ROC, her MSCE from the University of Rhode Island, USA, and her PhD from Rutgers University, USA. She is the Co-Series Editor of the Handbook of Environmental Engineering series (Springer), and a member of AWWA, WEF and OCEESA. Nazih K. Shammas is an environmental consultant and professor for over 45 years. He is an ex-dean/director of the Lenox Institute of Water Technology, and an advisor to Krofta Engineering Corporation, USA. Dr. Shammas is the author of over 250 publica¬tions and 15 books in the field of environmental engineering. He has experience in environmental planning, curriculum development, teaching, scholarly research, and expertise in water quality control, wastewater reclamation and reuse, physicochemical and biological processes and water and wastewater systems. He received his BE degree from the American University of Beirut, Lebanon, his MS from the University of North Carolina at Chapel Hill, and his PhD from the University of Michigan, USA. J. Paul Chen has been a professor in the environmental engineering program in the National University of Singapore (NUS) since 1998. His research interests are physicochemical treatment of water and wastewater and modeling. He has published three books, more than 100 journal papers and book chapters with citation of above 4600 and H-index of 39 (ISI). He holds seven patents in the areas of adsorption and membrane technologies, and ballast water management systems. He has received various honors and awards, including the Sustainable Technology Award from the IChemE, Guest Professor of the Huazhong University of Science and Technology and Shandong University of China, and Distinguished Overseas Chinese Young Scholar of National Natural Science Foundation of China. He has been recognized as an author of highly cited papers (Chemistry and Engineering) of ISI Web of Knowledge. Professor Chen received his MEng degree from Tsinghua University and his PhD degree from Georgia Tech.